What’s in Your Emergency Operations Plan? Are you a religious leader or perhaps in charge of security at your Church or house of worship? Are you a school administrator, a teacher, or maybe just a concerned parent? Or maybe you just want to learn what we can do to make ourselves less attractive to active shooters. Join us as we take a deep dive into data gathered from 48 mass shootings that have occurred since Columbine, to determine what we can learn from these tragedies, including whether magazine capacity restrictions or banning certain types of firearms would have changed the outcome. 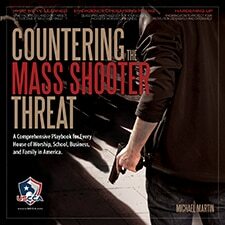 We’ll also explore whether proverbial “gun-free zones” figure into mass murderers’ planning; whether the response of the victim has made a difference; and whether “universal background checks” or other gun control proposals stand a chance at stemming the current trajectory of mass shootings. This class does not engage in knee jerk politics, but instead uses real, comprehensive data to uncover ways to combat active shooters once and for all. This is not a self-defense or firearms training class. What Are Universal Background Checks, and Would They Stop Mass Shootings? End attacks early and minimize the number of victims with strategic planning and preparedness training. Learn the lifesaving measures you can take to save critically injured victims after an attack is over. Uncover how you can identify and deter potential active shooters before they strike.